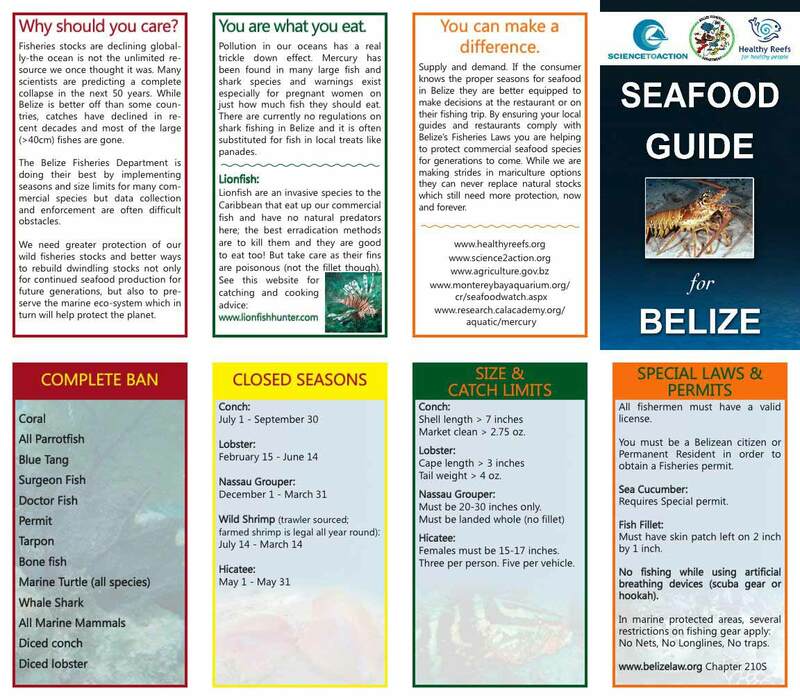 Seafood Guide to Belize: Closed seasons, banned catches, size and catch limits, Special laws and permits. Why you Should Care. Fisheries Stocks are declining globally the ocean is not the unlimited resource we once thought it was. Many Scientists are predicting a complete collapse in the next 50 years. While Belize is better off than some countries, catches have declined in recent decades and most of the large (>40cm) fishes are gone. We need greater protection of out wild fisheries stocks and better ways to rebuild dwindling stocks not only for continued seafood production for future generations but also to preserve the marine ecosystem which in turn will help protect the planet. You are what you eat. Pollution in our oceans has a real trickle down effect. Mercury has been found in many large fish and shark species and warnings exist especially for pregnant women on just how much fish they should eat. There are currently no regulations on shark fishing in Belize and it is often substituted for fish in local treats like panandes. Lionfish are an invasive species to the Caribbean that eat up our commercial fish and have no natural predators here; the best eradication methods are to kill them and they are good to eat too. But take care as their fins are poisonous (not the fillet though). Posted : Marty Casado - Tue, Apr 16, 2013 11:23 AM. This article has been viewed 14246 times.